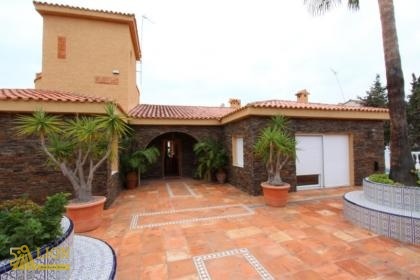 LJ1146 - Exclusive luxe villa met gastenverblijf Campoamor (Orihuela Costa) - LION Real Estate Group S.L. Of 275 m2 in one level. Amazing designer living room of 80 m2, exclusivce kitchen, office, 3 double bedrooms, 2 bathrooms. The master bedroom of 45 m2 has a walk in closet, an on suite bathroom with a hydromassage cabin with TV, sauna, etc. Roof terrace with sea views. Airco in all rooms. Heating with radiators. Next to the swimming pool there is the SPA area with a hydromassage cabin, sauna and bathroom. With separate entrance, 1 large bedroom and 1 bathroom. Closed garage for 3 cars. Amazing garden in japanese Zen style with differen areas: dining area, chillout ara, BBQ and bar. Heated swimmingpool with differen lights. It stays on 32º the whole year. 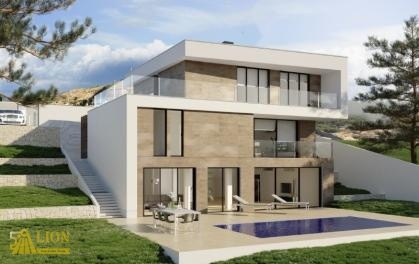 Moderne nieuw te bouwen eerste lijn design villa met zeezicht en zwembad in El Campello.